Category 9 has now been added, and is similar to category 5. A bit stronger attacks, a bit less health. Currently there aren’t any Category 9 dragons. Maybe something the Titans will be bringing? With the Breeding Dome being opened and the new element dragons available for breeding, 3 new levels of category have been opened up. They can be a bit confusing because they are not a simple progression like category 1 to 5 has been in the past. In the past, the categories were very simple. The higher the category, the more life the dragon would have and the more damage they would do. These are base values, and don’t include any other modifiers like stars, so they don’t match up to what the final values will be. But it gives a clear picture of how the progression was laid out. Higher category = better! The new categories break the mold. Higher category isn’t always better, and HP and ATK are modified independant of each other. As you can see, the new categories introduce a tradeoff of ATK and HP. Category 6 hit harder than Category 8 dragons, almost as hard as Category 5, but have a lot less hitpoints than either. They have the same health as a Category 2 dragon in fact. Category 8 dragons are the tanks. They have tons of hitpoints, but not that great attacks. Category 7 dragons are a nice jack of all trades. They do a little less damage than a Category 4, but have a bit more health. One area where the new categories keep the same trend as the old is in regards to Dragon Master points. Each category level is worth 1 point per dragon level. So a Category 5 dragon at level 40 is worth 200 Dragon Master points. This formula is the same for the new categories, so a Category 8 dragon is worth a whopping 320 Dragon Master points at level 40. 120 more points than a Category 5. However, until there are habitats that can hold at least 3 Dragons that these new Category 8’s and 7’s (and 4 dragons for 6’s), they don’t make sense for going after Dragon Master points. Because with 2 dragon limits on the habitats, the best you can do is 640 points from a habitat … compared to 800 from 4x Category 5s. 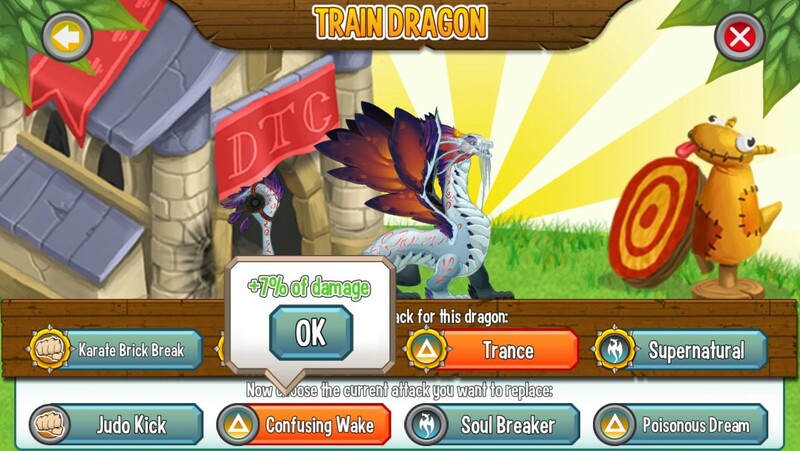 Remember that none of the new dragon elements have any strengths or weaknesses. Category 8 dragons are going to make for long fights! But in the end, the new categories really aren’t that interesting. Category 5 dragons are still better fighters, even if Category 8 dragons have more health. There is a CAT 10 now isn’t there? where do you list which ones are hybrids? Can anyone tell me why I can only get 1 parrot per like 5 hrs? Im breeding hybrids but only get 1 per pool I guess. How do I get my dragons over level 40 if there’s no new Temples? What does ATK mean please??? We got a new kindle fire for Christmas my daughter started playing DC on it, is there a way to log it into the facebook game without loosing the dragons she made on the kindle? The only ancient dragons i need are Amber, Balloon, and Chakra. PLZ help! How do you determine catagories? Thanks. Wasn’t there a breeding chart where you placed a dragon and it SHOWED what you get with different dragons? No percentages, just dragons. Those worked EVERY time but I only copied 3 dragons worth! I would truly like to see that again. What do the dragons flags mean. m the first is the dragons strength, the second is their weakness but what about the third and fourth flags? How do you get lots of gems? I got Titan this weekend in the Titan Island event and fattened him up to lvl 30 and maxed out on his training hits. Have used him now in some tournament battles and it has about half and half wins losses. at lvl 30 he has 21,???? So when hit by 40 lvl legends he goes down fast, lower lvls he wins every time. To be totally honest I was a little disappointed at first until i just read the category’s and how they are rated. At least I understand a lot better, as to why his hits aren’t that strong. However I may use some of the others I won in Titan that are Cat. 5 and see how they do thanks for the info Joseph, it helped a lot. I was able to get every Dragon Titan had for the event so will be checking them out, and will let others know if I discover anything. Here are some combos I’ve breed already. How do you know what dragons to feed in the titan challenge? Never sure, don’t want to waste food unnecessarily. How exactly are people getting millions of Dragon Master Points? If you look at the “Global” listing, the top 5 all have 1 million and higher points, with the #1 spot having 402.6 million Dragon Master Points?? How are they doing this? I now have 12 Ancient dragons but they are terrible in combat ( very few hit points, even when trained or lvl. 40) disappointing. is there somewhere that explains categories? Ok, I kinda’ got it. What is the Dragon Master? I did not understand one bit of those instructions. Every habitat available is Big and for War and Lights its 25/30 million cost … and i don’t have that money ? Please tell me if this applies to you. I have tested in 3 accounts and its the same ? conclusion they are waste for battle.